Jeff Weintraub: Paul Krugman - "Fiscal Poison Pill"
Today's op-ed by Paul Krugman (below) explains what it means. A poison pill, in corporate jargon, is a financial arrangement designed to protect current management by crippling the company if someone else takes over. As I read the nonpartisan Tax Policy Center’s analysis of the presidential candidates’ tax proposals, I realized that the tax cuts enacted by the Bush administration are, in effect, a fiscal poison pill aimed at future administrations. True, the tax cuts won’t prevent a change in management — the Constitution sees to that. But they will make it hard for the next president to change the country’s direction. Exhibit A of the poison pill in action is the sad case of John McCain, part of whose lingering image as a maverick rests on his early opposition to the Bush tax cuts, which he declared excessive and too tilted toward the rich. Since then the budget surpluses of the Clinton years have given way to persistent deficits, and income inequality has risen to new heights, vindicating his opposition. But instead of pointing this out, Mr. McCain now promises to make those tax cuts permanent — and proposes further cuts that are, if anything, tilted even more toward the wealthy. And how is the loss of revenue to be made up? Mr. McCain hasn’t offered a realistic answer. You can explain though not excuse Mr. McCain’s behavior by his need to shore up relations with the Republican base, which suspects him of being a closet moderate. But he’s not the only one seemingly trapped by the Bush fiscal legacy. 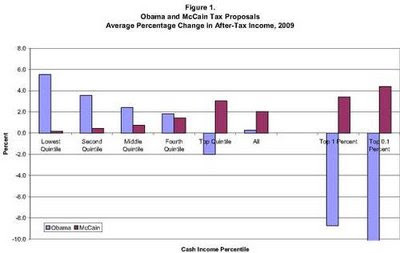 The Obama plan is also far more progressive, sharply reducing after-tax incomes for the richest 1 percent of Americans while raising incomes for the bottom 80 percent. But while $700 billion may sound like a lot of money, it’s probably not enough to pay for universal health care, which was supposed to be the overriding progressive priority in this election. Why doesn’t Mr. Obama propose raising more money? Blame the Bush poison pill. First of all, Mr. Obama — like, to be fair, his main rivals for the Democratic nomination — isn’t willing to challenge the Bush tax cuts as a whole. He only proposes rolling back tax cuts for those making more than $250,000 a year. Second, Mr. Obama proposes giving back a substantial part of the revenue raised by this partial tax-cut rollback in the form of new tax cuts. These tax cuts would mainly benefit lower- and-middle-income families, although this can’t be said of Mr. Obama’s plan to eliminate income taxes on seniors with incomes under $50,000: since most seniors already pay no income taxes, this would do nothing for those most in need. And one wonders why we should create the precedent of exempting particular demographic groups from taxes. But the big question is, are these tax cuts, however appealing, a top priority? The most expensive proposal, under the title Making Work Pay, would give most workers $500 in tax credits, at a 10-year cost of more than $700 billion. Isn’t it more important that workers be assured of health care? The problem, I believe, is that even Democrats have bought into the underlying premise of the Bush years — that the best thing you can do for American families, or at least the only thing that can win their votes, is to give them a tax break. One more thing: on Friday Mr. Obama declared that he would “extend the promise” of Social Security by imposing a payroll-tax surcharge on people making more than $250,000 a year. The Tax Policy Center estimates that this would raise an additional $629 billion over the next decade. But if the revenue from this tax hike really would be reserved for the Social Security trust fund, it wouldn’t be available for current initiatives. Again, one wonders about priorities. Whatever would-be privatizers may say, Social Security isn’t in crisis: the Congressional Budget Office says that the trust fund is good until 2046, and a number of analysts think that even this estimate is overly pessimistic. So is adding to the trust fund the best use a progressive can find for scarce additional revenue? Anyway, back to my main theme: looking at the tax proposals of the two presidential candidates, it’s remarkable and disheartening to see how effective President Bush’s fiscal poison pill has been in restricting the terms of debate. Progressives, in particular, have to hope that Mr. Obama will be more willing to challenge the Bush legacy in office than he has been in the campaign.